Reducing enclosure resonances has been the increasing focus of speaker designers over the past two decades. The trend can trace its origins to Wharfedale’s sand-filled enclosures of the 1960s. Since that early primitive technique, designers have employed ever more sophisticated methods of building enclosures that add less distortion to the music. Indeed, manufacturers have engaged in a veritable arms race to develop the most inert cabinet. But of all today’s elaborate and sophisticated methods for making enclosures stiff and well damped, surely none is as epic as that of the new Rockport Lyra. Rockport Technologies has long been a pioneer in developing innovative methods of cabinet construction, but the company pulled out all the stops for the Lyra. No other speaker enclosure has ever been built to this level of sophistication. For many years Rockport has eschewed making cabinets from flat sheet stock in favor of advanced molding techniques. For example, the enclosure of Rockport’s Altair (see my review in Issue 214) is made from an inner and outer fiberglass shell, with the void between them filled with dense epoxy (see photo, a cross-section of the Altair’s cabinet, on the following page). This method not only creates a stiff and dense enclosure, it also allows cabinet shapes optimized for acoustic performance without the limitations imposed by gluing together flat sheets of material. An added benefit is a seamless monocoque structure with no joinery. For the Lyra, Rockport has taken this concept to an extreme. Rather than make the inner and outer shells from fiberglass or even carbon-fiber, the Lyra’s two “shells” are massive cast-aluminum structures. The inner enclosure fits inside the outer enclosure, the joint is sealed, and then the cavity is filled with a proprietary, high density, highly damped urethane core material. 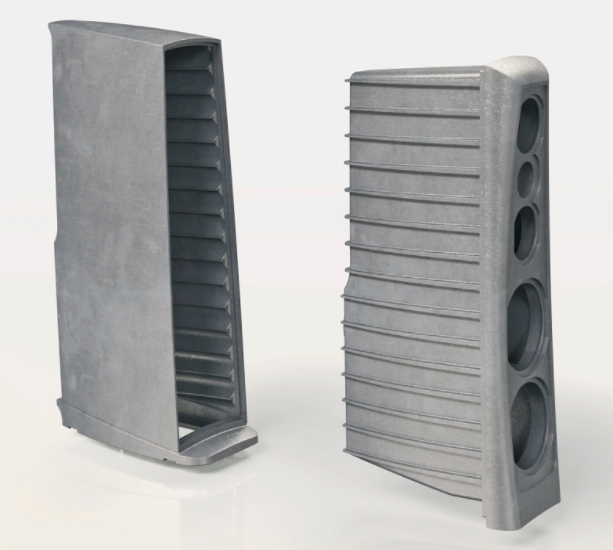 The inner enclosure (which is also the baffle) is an intricately designed casting with extensive reinforcement structures inside to brace the drivers. Rockport created a 3-D animated video showing this technique (available on YouTube). The company calls this construction technique “Damstif,” which appears to be exceptionally dense, stiff, and well damped and should reduce enclosure vibration to levels never before realized. But why go to such extreme lengths and expense to reduce what must be infinitesimally small cabinet resonances? Isn’t the Lyra’s construction overkill—a solution in search of a problem? Can such a small amount of vibration in an enclosure like Rockport’s Altair even be audible? Without hearing the same speaker with and without the Lyra’s cabinet construction, that’s a difficult question to answer. What I can say with confidence, however, is that every speaker I’ve heard that features an elaborate enclosure has reduced a specific form of distortion that in the past I’ve called “self-noise.” Self-noise is manifested as a less-than-black background, reduced immediacy of transient attacks and decays, loss of very fine timbral and spatial detail, a diminution of tone color richness, and compromised focus and clarity. All these phenomena occur at a very low level, but combined, they add up to a sound that exposes its electro-mechanical origin rather than one that instantly makes you forget you’re listening to anything other than music itself. It’s worth noting that the human hearing system’s exquisite sensitivity to minute changes in air pressure; at the threshold of hearing, the ear drum’s displacement is about one-tenth that of the diameter of a hydrogen molecule. My experience with the Rockport Lyra suggests that reducing cabinet resonances even further than they were reduced in the Altair results in not just a small improvement in sound, but renders a gestalt shift that vaults performance into previously uncharted territory. Just a brief listen to the Lyra reveals what reproduced music can sound like when freed from “self-noise”—and exposes the colorations we’ve become used to in other speakers. As we’ll see, an inert cabinet is only part of the Lyra’s extraordinary design and execution. The $169,500 Lyra is positioned in the Rockport line below the $225k Arrakis and above the $102,500 Altair. The Lyra is relatively small for a world-class reference speaker. Although far from the largest speaker I’ve had in my room, it is the second heaviest at 560 pounds each out of the crate. Helping to tilt it out of the crate (it is shipped on its back), I quickly developed an appreciation for just how dense the Lyra is— it feels like a solid block of lead. The enclosure’s graceful curves soften the Lyra’s presence, giving it a more organic and less industrial feel than that of many of today’s loudspeakers. The top panel slopes up and back, narrowing toward the rear. The Lyra is by far the best-looking speaker Rockport has made. The cabinet can be finished in any color of automotive paint you choose, but some specialized colors carry an additional charge. The Lyra is a three-and-a-half-way, five-driver design with a rear-firing port. Two 6" midrange drivers flank the 1" waveguide-loaded tweeter, with two 10" drivers on the bottom. Both midrange drivers cross over to the woofer at 150Hz, but with one midrange operating up to the tweeter transition at 2.1kHz, and the second midrange rolling off at about 400Hz. The woofer and midrange units are completely designed in-house by Rockport, as is the tweeter’s waveguide. As I mentioned in my review of the maker’s Altair (still the best $100k speaker on the market, in my view), each crossover in every Rockport speaker is hand-tuned by Rockport founder and designer Andy Payor. I’ve watched this process first-hand; he measures and hand-trims the speaker’s crossover with the drivers in phase, then reverses the phase of the tweeter and hand-trims the crossover components again to produce the maximum null. When the drivers are put back in correct phase, their outputs sum perfectly. In every Rockport speaker that has ever been made, Payor has hand-tuned the crossover. That, folks, is remarkable dedication to your craft and to your customers.